In Computer Science there is a machine. It was first envisioned by Alan Turing in 1936 and it bears his name. It’s more powerful than any computer that has ever been made or will ever be made, despite running on a magnetic tape. How is this possible? Well, it isn’t. Not strictly speaking. You can’t build a Turing Machine because Turing Machines need something that doesn’t exist. They need infinity. In fact, they need two infinities. A Turing Machine’s incredible power relies on an infinite length of tape and an unlimited amount of time. And yet, Turing Machines are useful. They’re the conceptual basis for modern computer systems, because what’s true of a machine with an infinite length of tape and an infinite amount of time is often also true of a machine with a large amount of memory and a fast microprocessor. Nor is Computer Science the only science with such a machine. Physics has the Carnot Heat Engine. Devised by Nicolas Léonard Sadi Carnot in 1824, it doesn’t require any infinities, but it does violate the Second Law of Thermodynamics. As with the Turing Machine, the Carnot engine is useful despite its physical impossibility. It defines the boundaries of what is possible for a heat engine. These conceptual models of simple and useful but impossible things show up in many disciplines. Even Economics has its equivalent. You may have heard of it: the Free Market. You’ll often hear pundits, and even economists who should know better, talking about “The Free Market” as if that were a thing that actually existed in the real world, but a Free Market isn’t the same thing as a Private sector, and it’s not some utopian anarchy. It’s an impossible machine. A conventional description of a Free Market describes a marketplace entirely free of coercion or fraud. Free Markets can do wonderful things in theory, and they’re a useful approximation for a real market in many situations. Of course, real markets aren’t free. Real markets have coercion and fraud, things not considered by the simplistic Free Market model, and these things are unavoidable. The only effective tool against coercion and fraud is, oddly, coercion. Specifically coercion of the sort practiced by governments. With the power of government, we can remove bad actors from the market and compensate for the subtler imperfections of real markets (what are called market failures.) Ultimately, it’s only with extensive government intervention that a market can approach the impossible perfection of a Free Market and summon Adam Smith’s Invisible Hand. This entry was posted in Economics, Saturday Edition and tagged Computer Science, Economics, Free Market, Physics on June 21, 2014 by JediBear. Welcome to the new site of JediBear’s Cave, once of Xanga obscurity. 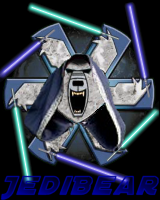 I’m your host, JediBear, who some of you may know from ClassicBattletech or may otherwise have seen around the web. I’ll be importing some of my old posts later, and with any luck you’ll see new ones going forward. This entry was posted in Cave News on June 21, 2014 by JediBear.